The Bulldog Expression. 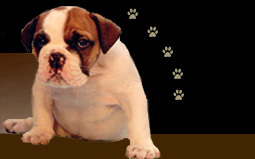 Correct Expression of the English bulldog. A very important feature of the bulldog is his expression. 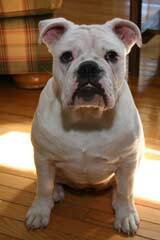 A dog may possess a great number of the necessary points as stated by the breed standard, and, nevertheless, fail to have a true Bulldog expression. Lacking a true Bulldog expression is considered a severe defect. However, to describe what the correct Bulldog expression should be is very difficult. A 1905 source describes it as follows: "Courage, even ferocity, combined with intelligence and honesty - sourness is perhaps the word that best describes the expression, yet it is the sourness of aloofness rather than the sourness of ill-temper, a sourness that in a human being would probably be described as haughtiness." heavy ears, which are badly carried. teeth that are visible when the mouth is closed. For more information about the correct bulldog head and expression, please refer to our morphology pages detailing the bulldog's head side view and front view. The information contained in this article expresses the opinions and views of the owner of Bulldoginformation.com or the original author of the article. It is not intended to be used as a substitute for professional veterinary advice. No responsibility or liability can be accepted for any loss or damage which results from using or misinterpreting any opinions uttered, products suggested or information mentionned in this web site, whether this information or advice stems from the owner of the site or from a third party.